Summer is a great time for families to build new traditions. Your family may already have favorite traditions such as birthday and holiday celebrations and so the idea of starting a new tradition may seem daunting. No worries. All you need to do to launch a new tradition is start an activity that can include the whole family. If everyone has a good time, find out why and then make plans to repeat the activity next year. Children in particular can benefit from family traditions, according to various parenting experts, because an activity that repeats from year to year gives kids something to count on and look forward to, promoting a sense of security and stability. Here are five ideas for starting a family tradition that never grows old. 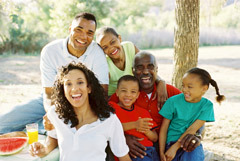 Family photo shoot: A great family photo can be a treasured heirloom. A series of photos that show how family members have grown and changed over the years can become a priceless archive. Why not build a tradition around an annual summer family photo? Select an outdoor spot that everyone loves. Beaches, parks, meadows and gardens all make lovely backdrops. Compose the photo carefully, so that everyone is clearly in view. Resolve to return each year. Before you know it, you’ll have a wonderful family album. July Fourth event: Building a family tradition around the Fourth of July is easy to do. Select an event that everyone will likely enjoys, say fireworks, a concert or a parade. Poll everyone ahead of time to make sure the proposed event has universal appeal. After all, not everybody likes the same things. Make sure that all family members can clear their schedules for the event, and then establish it as a family tradition you share each year. Camping in your backyard: You may not be able to afford a trip to a national park, but you may be able to start an annual family tradition of pitching a tent in your backyard. This tradition may have a short shelf life, while the kids are young, but it could provide fun memories to savor for years. No need to buy an expensive tent from a sporting goods store. If you have a clothesline and old blankets, you can improvise. You’ll find directions online for simple do-it-yourself tents. Ideas for what to do in nature’s hotel room? How about singing silly songs, playing “Truth or Dare,” having a pizza party, or taking videos of your family’s antics under the stars. Planting a garden: It’s a great way for the family to bond in summer and is the kind of tradition that can cultivate a keen appreciation for nature’s bounty. Your annual family project could be elaborate, such as a vegetable garden that takes lots of time and tending, or as simple as replanting flowers bought at a garden center into containers or the ground. The goal is to have everyone lend a hand in creating the garden, including the little ones. Even the youngest child can dig small holes to plant seeds in pots or window boxes. Gathering the generations: Grandparents Day is a late-summer commemoration around which you could build a beloved family tradition. It’s on the first Sunday after Labor Day, and this year falls on September 7. What better way to nurture family ties than with an activity that gets the generations together to honor the family elders? Kids, parents and grandparents can share activities such as creating a family tree, cooking an old family recipe, or organizing family photos and mementos in decorative boxes.